Share a standard USB printer with multiple users over an Ethernet network. This palm-sized print server makes it easy to share a USB printer with users on your network. 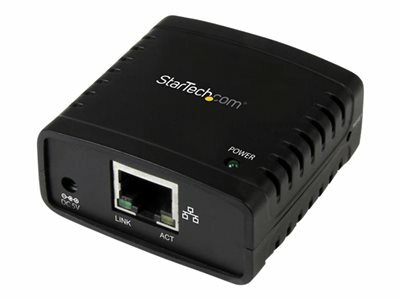 It's the ideal solution for home or small office networks. Enjoy cost-efficient network printing for multiple users. The USB 10/100 Mbps print server lets you share one USB printer with multiple users on your network, instead of having to buy separate printers for each individual workstation. With web-based management, you can set up and monitor the printer server through a web browser, so you can place your printer at any convenient shared location - there's no need to put your printer next to your computer. You can send print jobs to another user in your home or office, or even to a printer in another country. Compact and lightweight, the print server is easy to install with its straightforward installation wizards and remote web-based management. You simply use a USB cable to connect the print server to your printer's USB port, then use an RJ45 networking cable to connect it to the rest of your network. The printer server supports the Line Printer Remote (LPR) protocol which enables Internet printing. It also supports Bonjour Print Services, making it easier to find and configure printers on your network.